Kombucha is a probiotic drink (fermented tea) that is surprisingly easy to make at home! We brew so much that the kids have all learned how to make it and put together a fun little video tutorial! *** Start by watching the video tutorial above! Step 1: Bring 1/2 gallon of water to a light boil. Remove from heat and steep tea for 15 mins. Next, add sugar and stir until dissolved. Step 2: Clean jar with hot soapy water. Rinse thoroughly. Step 3: Add 1/2 gallon cool water to the clean jar. Add tea to the cool water in jar and allow to cool to room temperature (must be under 100F or cooler). Step 4: Add SCOBY and starter tea. Next, cover the jar with cheese cloth and secure with string or rubber band. Step 5: Allow to sit for 5 days. Test the kombucha using a straw, pushing past the SCOBY on top. If the tea is too sweet, allow to ferment longer. If it is too sour, you can dilute with a sweet juice (we like concord grape). It is best consumed when the taste is balanced between too sweet and too sour. When you are ready to drink it, remove the SCOBY and save 1-2 cups of mature kombucha to start your next batch (return to Step 1). You can add fruit juice or other flavoring and drink immediately. To add carbonation, fill bottles leaving 1/2” to 1” of space at the top and allow bottles to sit for additional 3-4 days at room temperature then refrigerate. 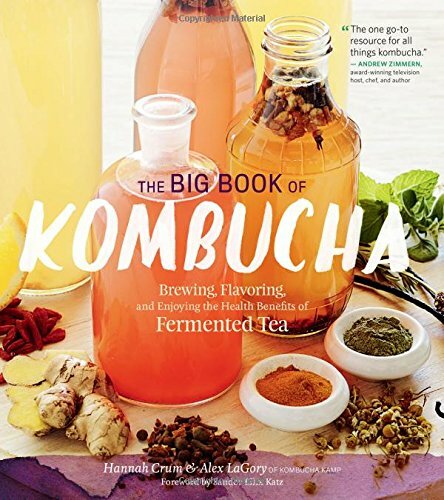 We highly recommend this Big Book of Kombucha for fun flavor recipes. Disclosure: All photos and images on this site are by Mara Wolff unless otherwise specified. Affiliate links are used at times, from which a small profit is earned from qualifying sales.